AU $112,530	Including Duty/GST Need Finance? AU $112,530	Including Duty/GST Need Finance? Need Insurance? A modern tribute to traditional Dutch boats, the long anticipated Delphia Nano is perfect for fishing fans and families. If you budget is happier with the low operating costs of a displacement boat, then this boat could tick all the boxes. 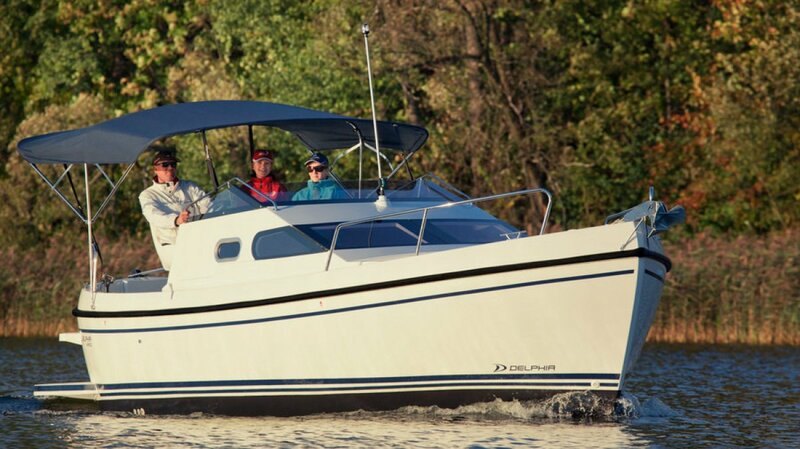 The boat is affordable in all respects, with a moderate purchase cost, and a low fuel bill after a weekend relaxing out on the water. With good standing headroom in the spacious interior, and surprisingly, a double transverse berth aft, a double v berth forward, and two setees there is plenty of sleeping capacity for the whole family. The light, bright interior is finished in beech coloured timber and also has a galley and a private enclosed head with a marine toilet and holding tank. The spacious cockpit has plenty of room for the fisherman, and also a removeable cockpit table for meals outside or unwinding with sundowners. 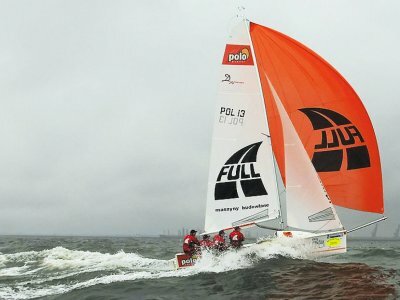 The outboard lifts for shallow waters or beaching, and a retracting centreboard aids in directional stability, and as a pivot point for sharp turns if manouvering in close quarters. Supplied on a tandem axle trailer with a winch and 4 wheel brakes, and with a combined weight around 1800kg the outfit is comfortably towed behind a medium to large family car or utility. The beam is 3m, providing a spacious interior, but will require wide load signs and flashing beacons in some states. A displacement boat is a slow comfortable boat, but with its modern easily driven hull, typical of the Delphia range of powerboats, a lot of horsepower is not required and a 4 stroke Yamaha 9.9hp Thruster is suggested in having excellent fuel economy but plenty of power at low speeds. 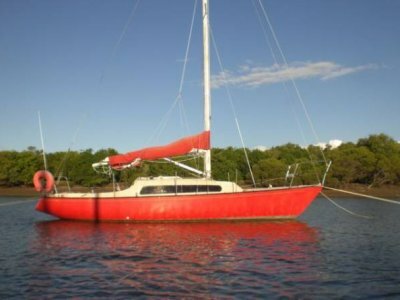 Aft transverse double bed, double v berth forward, dining table, 2 x setees, galley, enclosed head. Light, bright interior timber finishes in beech colours. Removable cockpit table. Marine toilet with 40Litre holding tank in enclosed head. 12V electric bilge pump, manual bilge pump. Fire extinguisher. Additional safety equipment to Australian standards to be added at time of delivery, 406 epirb, flares, life jackets etc. 12V battery, 100AH, LED cabin lighting, LED navigation lighting, master electrical switch panel, 12V power socket at switchboard, Fusion marine stereo with am/fm/vhf/ipod, usb and antenna. Compass, Lowrance Link 5 VHF transmitter with DSC and cable and antenna. Lowrance HDS7 combo gps/plotter/fishfinder depth sounder with built in antenna. Anchor roller, self draining anchor locker with place to store gas bottle, large opening hatch on foredeck, hatch over galley, large non opening panoramic windows, 2 x semi pushpits and 2 semi pullpits, spacious cockpit with plexiglass windscreen, 4 x mooring cleats, 4 x fairleads, removeable cockpit table, 2 fishing rod holders. Heavy duty tandem trailer with winch and 4 wheel brakes. 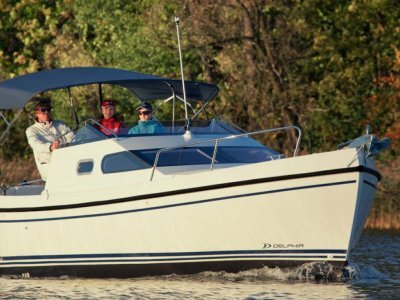 If you think about this boat's roots in the North Sea, you would think of a sturdy craft that could handle bad weather safely, and with its spacious interior with good headroom and well thought out interior, it ticks all the boxes as being a very economical family boat that wont break the budget. Pricing is correct as at 9-06-2014 but can vary due to currency exchange fluctuations.